Burning 130 kilograms of fuel each second and travelling at 4800 km/h... over 55 years ago. "We have invaded space with our rocket and for the first time - mark this well - have used space as a bridge between two points on the earth. We have proved rocket propulsion practicable for space travel. This third day of October, 1942, is the first of a new era of transportation, that of space travel," said General Walter Dornberger. Devoted Nazi General Walter Dornberger and German rocket scientist Wernher von Braun were two men with a vision. The drive, energy and resourcefulness of General Dornberger, mated with the ingenuity and passion of von Braun, created one of the greatest technological achievements of the last century. The fact that this achievement was the product of the ruthless regime of Nazi Germany and the fact that many thousands of people died as a result of its production and deployment, taint the image of what otherwise would be considered a monumental triumph. 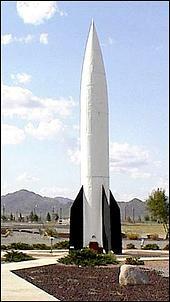 The V2 was the first unmanned guided ballistic missile. For guidance it used an advanced gyroscopic system that sent signals to aerodynamic steering tabs on the tail fins and vanes in the exhaust. 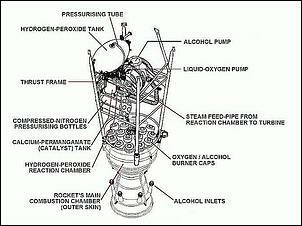 It was propelled by alcohol and liquid oxygen fuel. The two liquids were delivered to the thrust chamber by two rotary pumps, driven by a steam turbine. The steam turbine operated at 5,000 rpm and was powered by two auxiliary fuels, namely hydrogen peroxide (80%) and a mixture of 66% sodium permanganate and 33% water. This system generated about 25,000kg of thrust at the start, which increased to 73,000kg when the maximum speed was reached. The motor typically burned for 60 seconds, pushing the rocket to around 4,800 km/h. The V2 rose to an altitude of 83 - 93km and had a range of 320 - 360km. Before launch, the empty V2 weighed 4500kg. It was then fuelled with 4900kg of 'A-Stoff' (liquid oxygen with a temperature of minus 183 degrees Celsius), and 3710kg of a mixture of 75% ethyl alcohol and 25% water, called 'B-Stoff'. The air batteries and nitrogen batteries were filled up to 200 Bar pressure, and after this process the rocket weighed 12700kg. Electrical cables were then connected and gyroscopes powered up by 28 Volts / 60 Amps, DC. The cables remained connected until launch, batteries taking care of power supply during flight. After everything was set, pressurized air (at 32 Bar) pushed the hydrogen peroxide and the sodium permanganate into the 580hp turbine. This caused the turbine to rotate at 3,800 rpm. This turbine powered two pumps that injected the ethyl alcohol at 23 Bar pressure via 1224 nozzles (58 kg/sec) and liquid oxygen at 17.5 Bar via 2160 nozzles (72 kg/sec) into the burn chamber at 23 Bar. The mixture ignited, whereupon a temperature of 2,500 degrees Celsius at 15 Bar pressure was reached - but this was not enough to lift the V2. After checking to make sure propulsion was working properly, the burn speed was then raised and cables electromagnetically disconnected. The V2 engine burn chamber temperature was about 2,700 degrees Celsius. 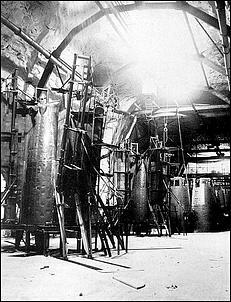 The chamber wall was cooled by the liquid ethyl alcohol flowing via the double wall of the beam tube and burning chamber, which also resulted in the heating up of the ethyl alcohol. During burn time the V2 was steered by four carbon graphite rudders (in the engine exhaust) and four vanes (at the fins), controlled by three gyroscopes. 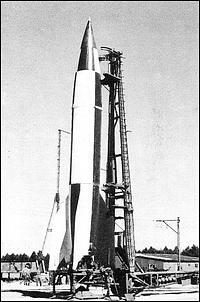 This huge German rocket - over 14 metres long - hurtled a 975kg warhead over 80 kilometres high and hundreds of kilometres down-range to its target. After engine shutdown, the V2 flew to a height of 97km and then fell to earth with an impact speed of 3,240 - 3,600 km/h. When launched against targets close to the operational range of the vehicle, the deviation between target and impact was normally 7-17km. This made the rocket only suitable for use against widely populated areas. At shorter targeting ranges, the accuracy of the V2 was improved. The Leitstrahlstellung was a "guiding beam" that improved accuracy of the V2 somewhat during the later days of the campaign. 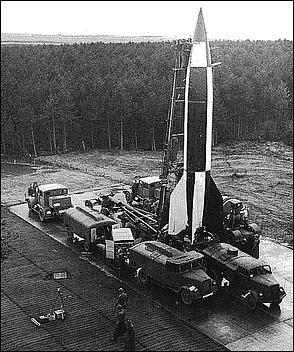 One quarter of all V2 rockets were guided with the Leitstrahlstellung. A V2 impact would be as follows. First, a whip cracking sound of a blast wave created by the rocket (moving faster than the speed of sound) bounced off of the point of impact just split seconds before the flash of impact. This was followed by the chaos of the explosion with debris and earth churned skyward. Soon, there followed the whine and rush of whistling air as the sound caught up with the rocket, followed by a deafening roar of the incoming rocket, which tapered off to silence. Since the V2 was not operational until late 1944, the countless funds, materials, and manpower that were used in its construction could have been better used to produce more planes and tanks. It was purely a "Vengeance Weapon", but there was no countermeasure that the Allies had to stop it. The V2 offensive would last from September of 1944 until March of 1945, with over 3000 rockets launched in this time period. The London area was hit by over 500 rockets and several hundred more dropped in surrounding counties. At first London and Antwerp were the primary targets, but rockets also fell around Ipswich and Norwich, and many Allied-held targets in France, Belgium and Holland, and even on Germany itself. 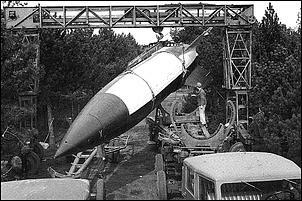 Despite the fact that the V2 was a weapon of war, more slave labourers died building the rockets than people were struck down by the explosive warhead that the V2 carried. 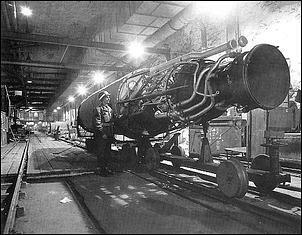 From 1943, the V2 rockets were constructed in an underground system of tunnels under Kohnstein Mountain, near Nordhausen. This move was as a response to Allied bombing of existing works - an environment protected from bombing needed to be found. The new plant became known as Mittelwerk. After meeting with Hitler on August 18th, SS Chief Heinrich Himmler had informed Armaments Minister Speer that he was personally taking over V2 production and placing SS Brigadier General Hans Kammler in charge of the complex. It was Kammler who had been in charge of building of the infamous extermination camps and gas chambers at Auschwitz-Birkenau, Maidenek, and Belzec. On August 28, 1943, two days after the choice of Mittelwerk, the SS delivered the first truckloads of prisoners from the concentration camp at Buchenwald to begin the heavy labour of expanding and completing of the tunnel system. Dora was the name given to the Buchenwald sub camp. The Mittelwerk V2 factory produced some 4575 V2s between August 1944 and March 1945. Prisoners were divided into two groups of workers: Transport Columns and Specialists. The former did the often backbreaking work of manually transporting much of the material that entered or left the tunnels, while the latter did other more skilled assembly and testing work. Detainees working in the tunnels were divided into a day and a night shift, each working for 12 hours straight. Every four weeks, the workers changed shifts. Each prisoner work group, or kommando, was headed by a prisoner leader (Kapo). Teams of six transport prisoners were assigned to carry into the tunnels the empty aluminium tanks for the rocket from the outside storage depots. Designed to be lightweight for their size, each tank still weighed about 150kg - or about 25kg per worker. The workers formed two parallel columns and grasped the hand of their counterpart alongside. The tank was then slung on their joined arms. If a group dropped its tank (not uncommon, since these skeletons of men were often already weak and sick), the SS guards and Kapo were there to kick and beat them with truncheons until they could lift their burden and continue once again. Since much of this work was done in the dead of one of the coldest winters on record, the workers were usually slogging though snow, ice, or freezing rain and mud. It is hard to imagine what is must have been like. On their feet they wore wooden clogs, and had very little protection from the elements. It is estimated that of the 60,000+ detainees employed in and around the Mittelbau complex over a 20-month period, 26,500 did not survive. One author attributes 15,500 of these deaths to the camps or to "transports", and 11,000 to the period in April 1945 when the camps were evacuated by the SS in the face of the American advance. This evacuation was especially barbaric. The SS shot prisoners, herded them into barns and burned them alive, left them to die if they were too sick to walk, or made them part of walking or rail convoys headed to other concentration camps. Each operational V2 to come off the Mittelwerk line cost about six terrible deaths. The British Operation Backfire occurred immediately after the war had finished. It was designed to completely evaluate the entire V2 system, interrogate German personnel specialized in all phases of it, and then actually launch several missiles across the North Sea. At the end of WWII, more than 8000 German rocket personnel had been captured, along with hundreds of scientists. A proposal was put forward that the German rocket troops be forced to demonstrate their V2 handling and firing procedures by actually preparing and launching some V2 rockets. The gun testing range at Altenwalde near Cuxhaven, Germany, which was in the post-war British zone of occupation, was chosen as the testing site. The captured German rocket troops were fairly willing to demonstrate their V2 firing procedures, and soon 200 scientists, 200 V2 firing troops, and 600 ordinary POWs were transported to Cuxhaven. The next step was to find some intact V2s. 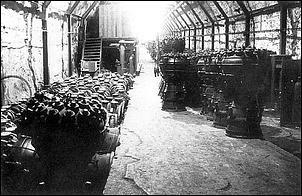 The Americans had removed enough parts from the underground Mittelwerk facility to assemble no less than 200 rockets in the United States. After the Americans were finished, the British were given their opportunity to salvage what was left before the Russians took over the Mittelwerk. 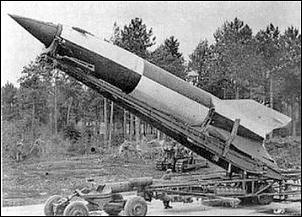 British officials found that they had enough parts to assemble about 8 rockets for their testing. They also found that they were missing several key components, as well as support vehicles needed to fuel and fire the rockets. What followed was an amazing search of Europe for the missing items. Search parties were sent out everywhere with soldiers who were fluent in German - each with a convoy of trucks - to hunt for the needed missing parts. When the search was finished, 400 railway cars and 70 Lancaster flights were used to bring the quarter-of-a-million parts and 60 specialized vehicles to Cuxhaven, the most elusive part being the batteries that operated the guidance gyros. Tail units were also hard to find intact, so some of these were called back from the United States. The explosive material in the warheads of the missiles was steamed out and replaced with sand. 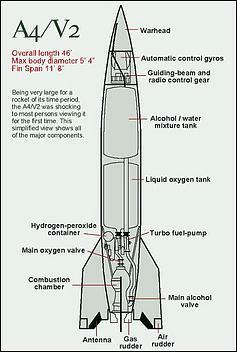 By the beginning of October 1945, the British were ready to begin testing the V2 systems. The rockets that were to be fired were painted in a black and white chequered pattern, similar to the early German colour schemes. On October 1, the first V2 launch attempt failed due to a faulty igniter. Another V2 was ready and the first successful British-directed firing of the V2 across the Baltic occurred on October 2, 1945, almost three years to the day after the first successful German test. 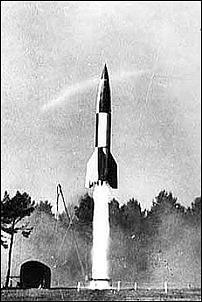 The third and last British V2 launch took place on October 15, 1945, with British, American, and Russian officials present. The V2 performed flawlessly and landed near its target point in the North Sea. The operation was concluded by mid-October. And the US? They were so impressed with the V2 that their famous Redstone rocket was developed by many of the same scientific team that had worked on the V2, and - further - used very similar technology. 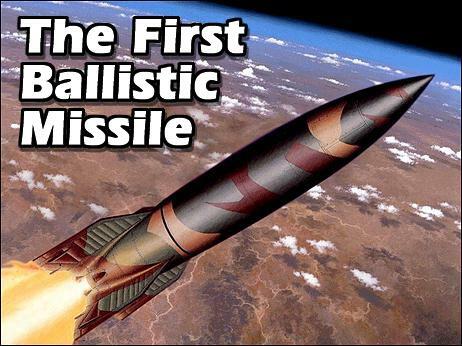 The Redstone was the first large US ballistic missile to be deployed overseas, joining the NATO Shield Force in 1958 and was not declared obsolete until 1964. The Redstone rocket also launched the first US satellite and put the first American astronaut into space. Many of the German team that had been responsible for the design of the V2 continued working on the American space program right through to the 1969 landing of men on the Moon.